Architecture studio OOPEAA plans to introduce waterborne swimming pools to coastal and riverside cities around the world, with the first set to be built in Oulu, Finland. Finland-based OOPEAA, short for Office for Peripheral Architecture, won a competition to develop the global concept for the Allas Sea Pool. The studio’s vision is to create a worldwide family of public saunas, spas, pools and public facilities that embrace the Nordic tradition for bathing and swimming outdoors all year around. Some elements, such as the pools, will be built as floating structures while others will be anchored to dry land. “The intention is to build a family of floating sea pools in coastal cities in different parts of the world,” explained OOPEAA founder Anssi Lassila. The design competition was organised by city development group Töölö Urban, following the success of a pilot sea pool built in Helsinki by Huttunen-Lipasti-Pakkanen Architects in 2016. Initially intended to be temporary, it had its permit extended and it still operates today. The challenge for OOPEAA was to develop this concept to be both scaleable and adaptable, so that it can be tailored to any global site. The studio’s design is for a modular system that can be changed to suit local requirements and seasonal changes. The structures will be created using cross-laminated timber, which offers flexibility and sustainability. 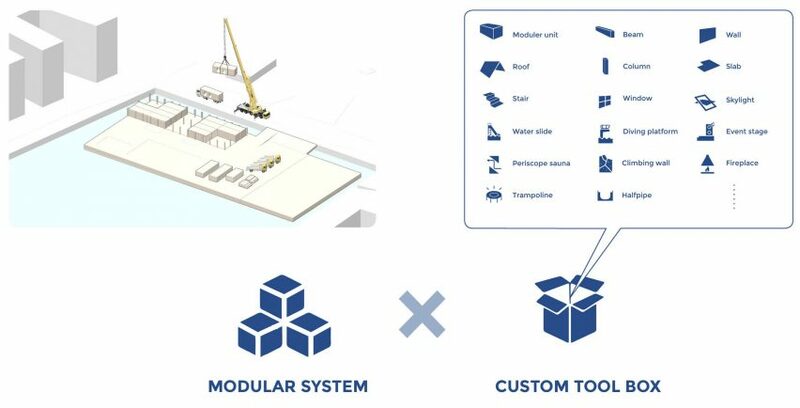 Each site will also be provided with a pre-fabricated custom toolbox of amenities, including a water slide, diving platform, periscope sauna and event stage, which can be added or removed at will. OOPEAA’s first Allas Sea Pool will be built in Oulu, a city in northern Finland, in late summer 2019. “It is an interesting opportunity for us to build an all-year-round floating outdoor pool in such northern conditions,” said Lassila. 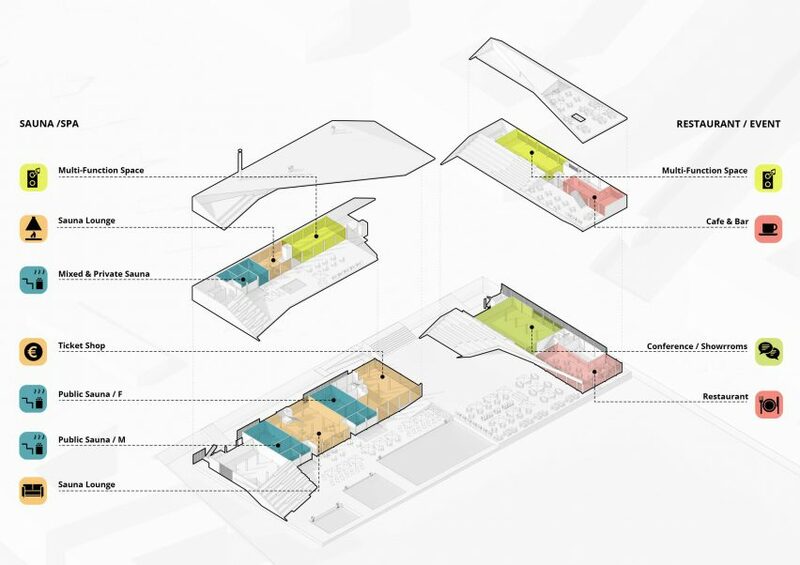 Each complex will be organised across two separate structures, with a large open space between them. One structure contains the saunas and spas, as well as a public area and rooms that can be rented for private events. The other structure contains the restaurant and cafe. Both feature large open staircases that create spaces where people can gather and observe the views of both sea and city as well as observe the activities. Both volumes also include sheltered spaces for colder weather. 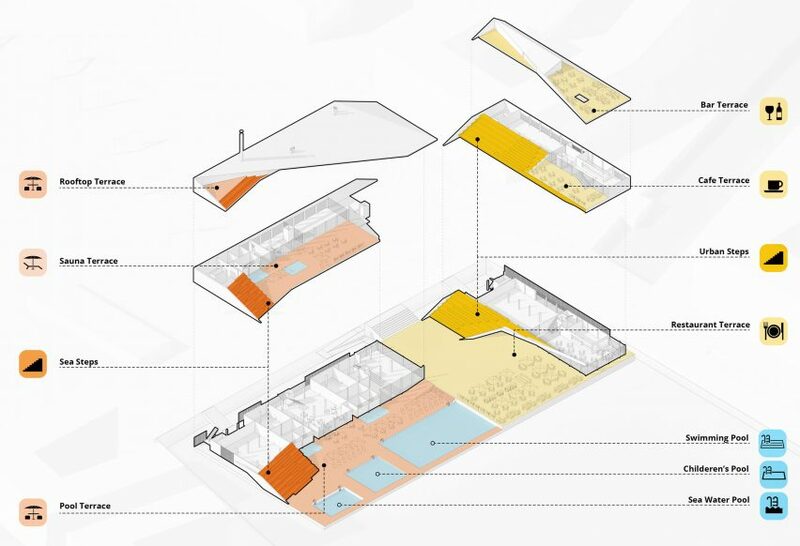 The different areas will be connected in a series of open-air spaces and vistas, as well as semi-open and enclosed spaces, all joined by pathways of transition. Saunas will be located at loft level, so visitors can enjoy views over the sea, without compromising their privacy. Lassila founded OOPEAA in 2004. He is known as a champion of cross-laminated timber in architecture, as a more sustainable alternative to steel. Past projects include a cabin-style wood and zinc sauna on an island in Helsinki’s archipelago and a wooden Periscope Tower on the edge of a rural lake, allowing visitors to enjoy the view without climbing up. The architect describes his concept for the Allas Sea Pool as “New Nordic Urban”. “The New Nordic Urban is essentially about bringing together the social sense of the urban – to see and to be seen and to share in the company of others – and a chance to enjoy nature and the element of water: contemplation, physical activity and sports,” he said.